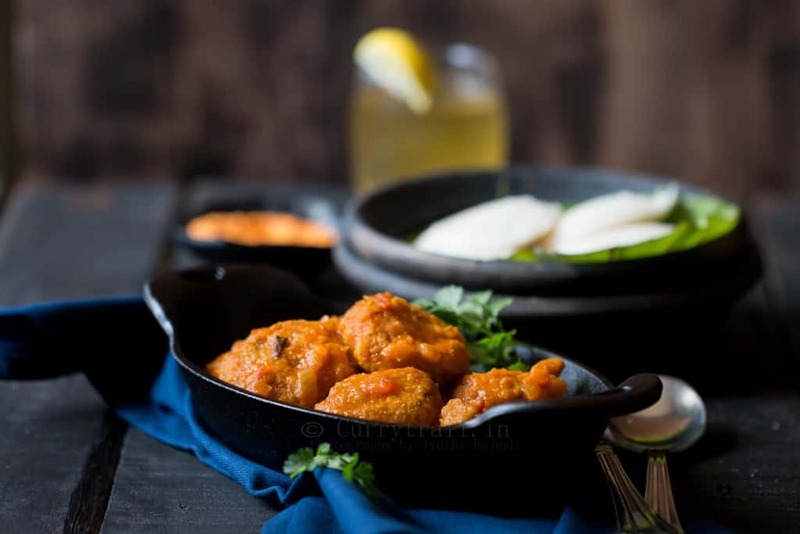 South Indian Vada Curry Recipe (Vadakari) is a speciality from Tamil Nadu which is made from masala vadai (Bengal gram fritters). Vada Curry is served as a side dish along with idli, dosa or even with Parottas. It is believed that vada curry was created by a small-scale hotel chef in Tamil Nadu. The chef had a lot of leftover masala vada from the previous night. 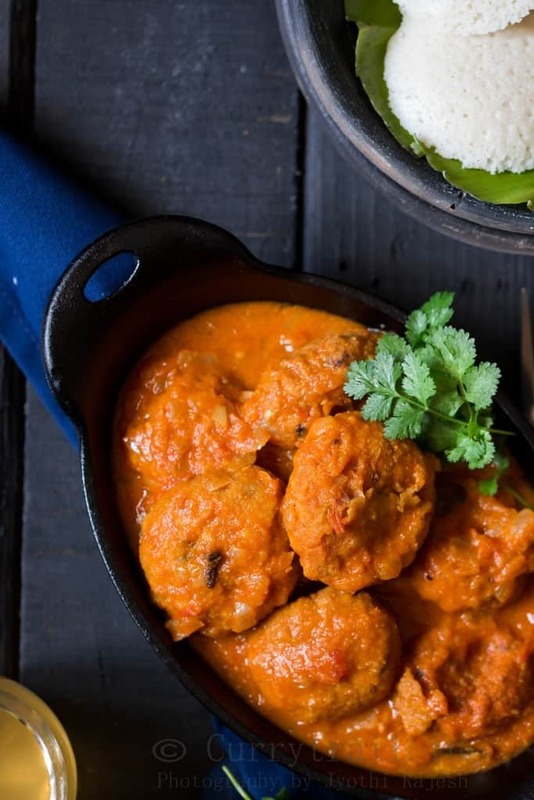 Next morning, while looking for ideas to use the leftover vada, the chef came up with this brilliant recipe where he crumbles the vada into smaller bite size pieces and dunked them in an onion-tomato masala curry. He served Vadakari with idli and dosa for breakfast to the hotel customers. People who tasted it liked it so much that they started coming back every morning asking for the same curry. The traditional Vadakari uses masala vada prepared the previous night. And trust me the curry prepared in traditional way tastes the best. Delicious, full of wonderful flavours and a perfect side dish for the breakfast along with idli’s/dosas. Jyothi says: Thank you Hina for inviting me to your space to share the guest post and a warm hello to all readers of ‘Fun, FOOD and Frolic. I met Hina almost a year back in one of the food photography workshops. My blog was newly born during that time. During the workshop, I got to know about her excellent photography skills and the wonderful blog. She is a wonderful person, shared some of her blogging experience with me and also was kind enough to explain me the tips that I didn’t know. Later we got connected through FB. I am in awe of the mesmerizing pictures and alluring food with descriptive recipes she has on her a blog. It is indeed a pleasure to share one of my personal favourite recipe (a family recipe) on her beautiful virtual space. About Jyothi: From a shy, nervous, novice blogger to a confident and established food blogger, Jyothi surely has come a long way. Jyothi Rajesh is an engineer by profession. She loves to cook, style and photograph food. She spends half of the week teaching Robotics to children and the remaining time in her kitchen. She is surely a multi-tasker, a doting mother of two lovely tiny toddlers, an expert teacher, and a passionate food blogger, she has many feathers in her cap. 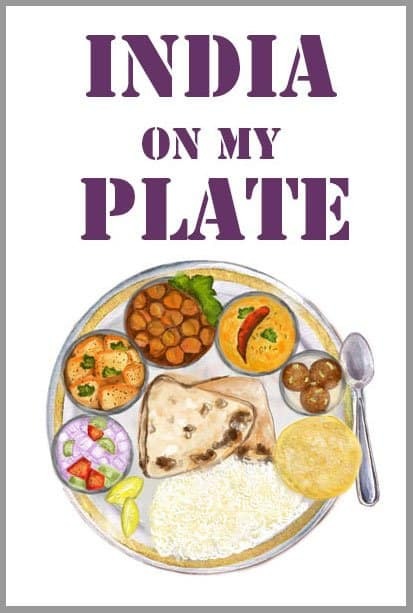 Her blog Curry Trail is the illustration of her culinary journey. 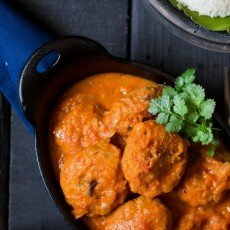 South Indian Vada Curry Recipe (Vadakari) is a speciality from Tamil Nadu which is made from masala vadai (Bengal gram fritters). Learn how to make vadakari in few simple steps. To prepare the vada, wash and soak channa dal in water for 3 hours. Fine chop the onions, green chilies and coriander leaves. Keep aside. Grind all ingredients mentioned under the list ‘to grind’ along with 1 teaspoon of water into a coarse paste. Set aside. Drain water from channa dal and grind it into a coarse paste. Avoid using any water to grind the dal. To the ground channa dal, add onions, coriander leaves, ground masala paste, salt and mix well. Heat oil in a deep heavy-bottom pan. Shape the vada round and slide gently into the pan of hot oil. Drain on a plate lined with kitchen towel. Instead of deep-frying you can steam the shaped vadas in idli steamer for about 12 minutes. To make the curry, heat 1 ½ tablespoon oil in a pan. Add bay leaves, cinnamon stick, cloves and fennel seeds to hot oil. Fry till aroma of spices is released. Add onion, green chilies and cook till onions turn translucent. Add ginger garlic paste. Cook until raw smell of the paste is gone. Add tomato puree (first blanch tomatoes in boiling water for about 8 to 10 minutes. Remove tomatoes from water, peel the skin and blend into puree). Cook until oil separates from the sides of the pan. Add all the spice powders along with salt, stir to combine. Add about 1 cup of water and bring the curry to boil once. Crumble the deep fried vadas into smaller pieces before adding it to the curry. You can add the whole vada as well in the curry. Simmer the curry over medium heat and let the vadas absorb the flavor of the curry. This takes about 12 to 15 minutes. Once the gravy is thick, turn off the heat. Garnish Vadakari with fresh coriander leaves. 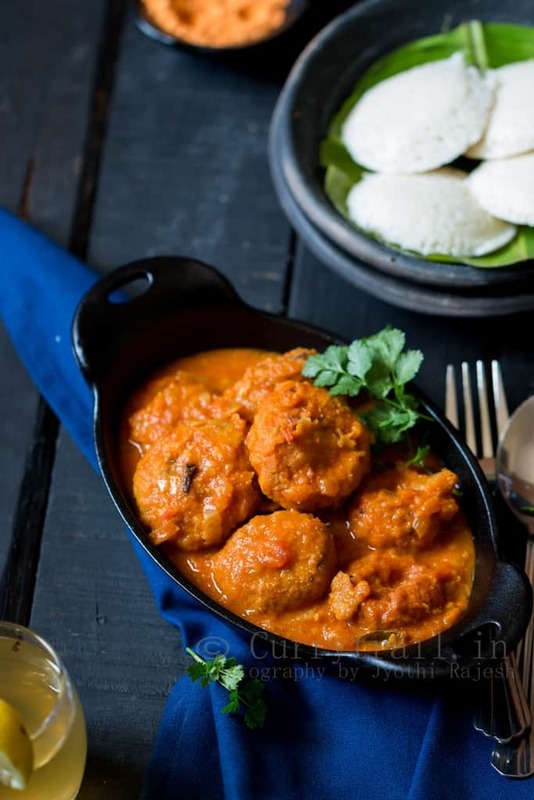 Serve Vad Curry warm as side dish for idli or dosa. Never prepared vada curry myself.But would love making it someday.Lovely guest post jyothi.You have a lovely space Hina. Joined you in facebook.